People (well, some people) are losing their sh*t over this (in my opinion) GREAT ad. Forget Resolutions – try these instead! When a journalist contacted me last year for some quick “Be happier by—” tips for a piece she was doing on the dreaded New Year’s resolution tradition I was not thrilled. I’m really not a huge fan of New Years’ Resolutions. But then I thought well, hmm… “Be Happier by -” That’s FAR better than “Be miserable, unrealistic and give up stuff I love up by – “. And so I replied to her with a list, she wrote the piece and I thought – that’d make a nice little post on my own blog some day. Then in true New Year’s fashion, I forgot all about it! I was going to start by saying I don’t want to frighten you, but actually I do. These are figures published today by CyberSafeIreland. Frightened yet? Lots of people are doing a lot of talking (again) about setting rules for kids around their use of technology and that’s (still) a really good thing. But when are we actually going to do it? We don’t have to look far to find examples of how tech is damaging (as well as enhancing) the lives of our kids – it leaks into everything doesn’t it? Nothing is untouched by tech these days – unless you are super strict and have none in your house.. in which case I guess you won’t be reading this.. While there is a lot written telling parents to set rules, there isn’t quite as much written about what exact rules to set. And so parents are still left scratching their heads somewhat – it’s not as if we can refer to what our parents did. We are still coming to terms with this shiny new toy ourselves! So, this is getting serious. As adults, we need to cop on, set the rules and stick to them. Starting off with rules and sticking to them is the way to go. Kids will not set their own boundaries, they are not equipped to do so and not only that, but they are relying on us to do this for them. Several weeks ago a thirteen year old boy that I work with told me he’d been awake ’til 3am gaming – an over 18’s game, but that’s not the main point. The main point that struck me was this – he said he was exhausted. That he couldn’t concentrate in school. I agreed that he certainly looked tired. He said “Ya.. I know.. I wish my parents would notice that..”. He said it would be easier for him if they just took his tech and set rules. That way he’d sleep better and be able to blame them when him gaming buddies whined that he wasn’t online. He thought it was nice that they trusted him but seriously – how could he resist the temptation?? Rules must be set, much as we want to communicate trust to our young people. One way to communicate that trust is to set rules, and then trust them to play ball. My suggestion is pretty old school: write a list of rules, stick them up on a wall, or several walls and be ready to discuss in advance and then issue consequences (not necessarily punishments) for rule breakage. These consequences will be removal of privileges – tech related privileges will likely work best . 1. 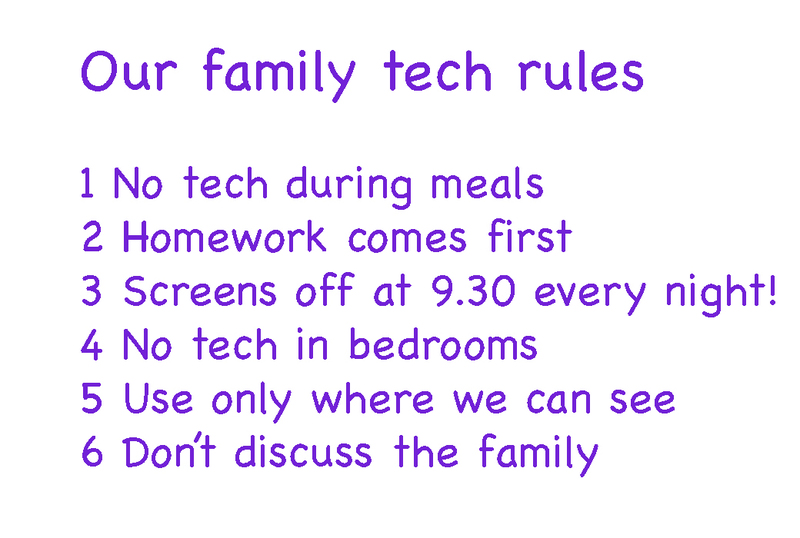 No phones (or laptops, tablets, iPads, iPods or TV’s) to be used in any way during meals. Ideally have a bowl or a box to temporarily chuck them into. Y’know, gently. Note your own discomfort with this idea (are you resisting it already??) This is where we need to model the behaviour we expect. If you don’t, you’ll look like a hypocrite to an acutely sharp teenage eye and also it will definitely get thrown into your face during a future argument! Phone etiquette is a modern social skill – we all need to adapt and learn it! 2. Homework first. Lots of houses have a rule where TV or whatever is turned on as soon as the school bag hits the floor – that’s certainly what happened in my house. My suggestion is though that access to tech happens only after homework and/or a small household job or two or done. This will have lots of benefits long term – your child will learn self-discipline, patience, and responsibility. It will also help them avoid the distraction and procrastination that goes with TV watching and it will enhance their enjoyment of said distraction when they finally get to it because nothing will be hanging over them. We need to teach relaxation and reward too! 3. Screens off at the same time every night. We know that the blue light emitted by screens, even small screens like phone interferes with the production of melatonin. This is bad news for sleepy time. And that’s bad news for pretty much everything from academic performance to overall physical and mental health. The ability to monitor what your child/teen is accessing (or what/who, is accessing them) is zero if the tech is in their bedroom. Allowing your teen to have a TV in his bedroom will only encourage him to watch a lot of TV and it will be nearly impossible to monitor what he’s watching and how much TV he’s watching. Another idea is to have phones shut down at night and handed over to you until morning. There are thousands of kids all over the world texting and snapping into the small hours and wandering around like zombies the next day. You can prevent this. And they can blame you if they get grief from friends who didn’t get the replies they wanted late at night. Two birds, one stone. 5. And while I’m there, all mobile devices and non mobile devices should be used in front of you so that you can see what they are accessing and monitor for inappropriate content. It’s true that other parents may not be this vigilant, but at least while they are in your home you can protect them in this way. I’ve heard parents say that they’ll access stuff elsewhere so what’s the point?! This may well be true if your have a normal child! However, if they have an anchor to refer to – ie your rules- it’s more likely that they will be aware of what’s OK and what isn’t, even if they access it. And that’s a good thing. 6. I’ve mentioned before in a piece about sexting that having passwords to your child’s social media is really important. And again – they may have duplicate accounts, they may have spare phones – it happens! You can only do your best to teach this stuff and have these conversations. As an aside, a friend of mine recently snapchatted a funny selfie to her 13 year old daughter’s friends which I thought was risky but genius! The daughter took it very well, surprisingly, not without eye rolling, but the real gold was this – now all the daughter’s friends know that her parents have access to her snapchat. Instantly reducing the risk of nastiness or inappropriate photos or comments coming her way. Have conversations about security online, how to block people, how to limit/ restrict people and how to be wise about who to follow and who to friend. Now I know that clocking up millions of friends is what your child will want to do and there is a limit to what you can control but this is not a reason to avoid the discussion. As with everything, we need to anchor ideas and standards so that we can, and they can refer to them. And so that they can blame the strict annoying adults if they need a ‘get-out’. 7. Warn your kids not to disclose family information online. It can be embarrassing and shaming on a personal level (“My brothers girlfriend dumped him LOL”) and it can be unsafe (Excited for family trip to Florida tomorrow!) – the local burglar industry will be thrilled with that one! Incidentally – I’ve seen adults do this too – do you? So here y’go – feel free to print if you think it’s a fit for you family. Depending on the ages you may want to tweak here and there. Finally, learn about the tech your child is using. I’ve mentioned this before when talking about sexting and I’ll continue saying it forever. Play their games, use their apps (that’s a piece I wrote after I discovered a child I knew personally was unwittingly putting herself out there) We the grown ups simply must know how stuff works. This will help keep your child safe. So, we know that screen time is linked to obesity, sleep issues, violence, behavioural issues, social issues, educational problems as well as all the good stuff of course. Setting boundaries and rules around its use will benefit the whole family – especially if you get creative and come up with alternatives! Good luck – it’s a challenge! Taking the earbuds out, making contact and getting home safe! Where do we draw the line when people treat us poorly? This is a quandary faced by many. Particularly if we have a fear of hurting people or being rejected by them. We like to be liked. We need to be liked. But at what cost?